In the 3rd of our Bible studies on the context of the events recorded in the New Testament, we take a look at the religious background to The Bible Journey. We're going to look in more detail at the page entitled Major Jewish Religious Festivals in The Bible Journey @ www.thebiblejourney.org. 1. Read the opening paragraph of Major Jewish Religious Festivals (below). Jesus of Nazareth was born into a Jewish family and brought up as a Jew. Later, he taught in the Temple in Jerusalem as a Jewish rabbi (religious teacher). It’s important to remember that he lived his whole life as a Jew, and all his early followers were Jews. Like all his Jewish friends, he observed the weekly day of rest (Sabbath or Shabbat) on Saturdays, and the annual Jewish religious festivals according to the traditions of his day. 2. Read Luke 2: 21-24. Which two Jewish religious ceremonies marked Jesus out as a Jewish child when he was only a few days old? 3. Read the next paragraph. The festivals, whose precise dates are based on lunar months, were laid down in the Law of Moses. There were three main annual Jewish religious festivals – Unleavened Bread (Passover), Weeks (Pentecost) and Ingathering (Tabernacles). Where do you think all Jewish men were expected to "appear before the Sovereign LORD" three times a year? This could be quite difficult if the family lived a long distance from Jerusalem, so some families only made the pilgrimage once a year. Nazareth was several days journey from Jerusalem. How often do you think Jesus's family went up to Jerusalem for the pilgrim festivals? 6. Look at the diagram below (Fig.3) showing the Jewish calendar and the major Jewish religious festivals. Passover occurs in March or April on the 15th day of the first month in the religious calendar (Nisan). Because it's the middle day of a lunar month, it's always full moon during the Passover festival. The Feast of Weeks came 50 days after Passover, so became known as Pentecost (‘pentekonta’ means ‘fifty’ in Greek). The Festival of Ingathering (also called Booths or Shelters) marked the end of the agricultural year (in October). Why do you think the religious festivals marked significant highlights in the agricultural year? 7. Read the next paragraph about the Festival of Unleavened Bread (Passover). The Festival of Unleavened Bread (Passover or Pessah) was held in the first month of the Jewish religious calendar. It was initiated to commemorate the Exodus (the ‘going out’) from Egypt in 1447BC when God led his chosen people out of slavery. The Jews were to eat unleavened bread (bread made without yeast) to remember that the Israelites didn’t have time to let their bread rise before leaving Egypt. Why is the Exodus of the Jewish people from Egypt commemorated by eating unleavened bread? 9. Read the next paragraph about Passover. The first day of the festival is often referred to as Passover or Pessah because the Israelites smeared blood on their doorposts so the Angel of Death would pass over and not harm their first-born. In commemoration of the Passover, each family killed and roasted a sacrificial lamb whose blood saved them from death. The festival was celebrated between mid-March and mid-April. The final day of the Festival of Unleavened Bread was called Firstfruits. On this day, the first sheaves of the barley harvest were presented to God. Why is the first day of the Festival of Unleavened Bread called 'Passover'? Why does John call Jesus "the Lamb of God who takes away the sin of the world"? 11. Read the next paragraph about Jesus attending the Passover in Jerusalem. 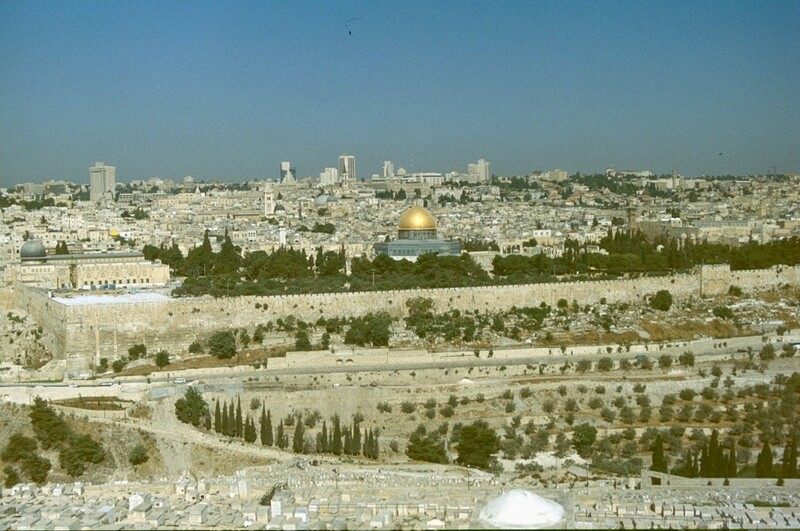 Jesus attended the Passover festival in Jerusalem in the spring of 27AD. The Last Supper, crucifixion and resurrection of Jesus took place during the Passover festival in the spring of 30AD. 12. Read John 2:12-16 and Matthew 26:17-19. Note that the 'Last Supper' was a Passover meal. Can you think how Jesus used the symbolism of the Passover meal to refer to his own sacrifice on the cross? 13. Read the next paragraph about the Feast of Weeks (Pentecost). The Feast of Weeks (Pentecost, Harvest or Shavuot) – the main harvest festival celebrating the end of the wheat harvest – was held seven weeks after the first barley harvest. As it was fifty days after Passover, it became known as Pentecost (‘pentekonta’ means ‘fifty’ in Greek). It usually occurred in late May or early June. Jesus’s early disciples were filled to overflowing with the Holy Spirit on the Day of Pentecost in 30AD. Why were there "Jews from every nation under heaven" staying in Jerusalem at this time? Why do you think God deliberately waited until this moment to fill the disciples with the Holy Spirit? 15. Read the next two paragraphs about the Festival of Ingathering. The Festival of Ingathering (Tabernacles or Sukkot) celebrated the gathering in of the grapes, figs and olives that had ripened during the dry summer months. It was the autumn harvest festival held in late September or October. Also known as the Festival of Tabernacles, Shelters or Booths, this feast also commemorated the time when the Israelites escaping from Egypt had no permanent homes and pitched their tents (tabernacles) or temporary shelters wherever they found sufficient water or grazing for their livestock. It’s usually celebrated between mid-September and mid-October. Jewish families often lived in temporary shelters or ‘booths’ during the festival. Jesus went up to Jerusalem to celebrate the Feast of Tabernacles in October 29AD. Why is this festival also called Tabernacles, Shelters or Booths? Why didn't Jesus go to the festival with his brothers? If you have time, you might like to look briefly at the Other Jewish Religious Festivals. 17. Read the next section on the Festival of Trumpets. Trumpets (Rosh Hashanah) – This festival, usually held in mid-September, celebrated the end of the agricultural year and the beginning of the New Year in the Jewish civil calendar (the beginning of the seventh month in the Jewish religious calendar). In an age with no written calendars, trumpets (originally the ‘shofar’ or ram’s horn) were sounded on the first day of each new lunar month, and as a sign of the new agricultural season. There is no reference to the Feast of Trumpets in the New Testament. 18. Read Psalm 81:3. Does this verse make sense now? 19. Read the following two paragraphs on the Day of Atonement. The Day of Atonement (Yom Kippur) – This solemn festival, at the end of September, was a time for remembering past sins (wrongdoings) and for making amends. It was the only day of fasting decreed in the Bible. Traditionally, the High Priest ‘atoned’ for the sins of the people once a year. He took a goat (the ‘scapegoat’) and symbolically heaped the sins of the people upon it before driving it out into the desert to take away their sins. The Letter to the Hebrews contrasts this annual ceremony of atonement performed by the High Priest with the once-for-all forgiveness of sins achieved by Jesus on the cross at Calvary. 20. Read Hebrews 9:6-7 & 11-14. Can you follow the comparison between the High Priest's actions on the Day of Atonement and Jesus's actions on the cross? 21. Read the next paragraph on the festival of Purim. Purim – this festival commemorated the actions of Queen Esther whose quick thinking and decisive action saved the Jewish exiles in Babylon and Persia from being massacred in 473 BC. It takes place in February or March. There is no reference to this festival in the New Testament. Why is this festival called 'Purim'? 23. Read the paragraph on the Festival of Lights (the Feast of the Dedication of the Temple or Hanukkah). Lights (Dedication or Hanukkah) – this festival was initiated to commemorate the re-dedication of the Second Temple by Judas Maccabaeus in 165BC after its defilement by King Antiochus Epiphanes. This re-dedication is recorded in the apocryphal First Book of the Maccabees. During the re-dedication, a single flask of olive oil miraculously kept the lamps in the Temple alight for the whole eight-day ceremony. Hanukkah takes place in mid-December. Jesus attended the Feast of Dedication (Hanukkah) in Jerusalem in the winter of 29AD. Why did the Jews pick up stones to throw at Jesus? Do you think they were justified in doing so?